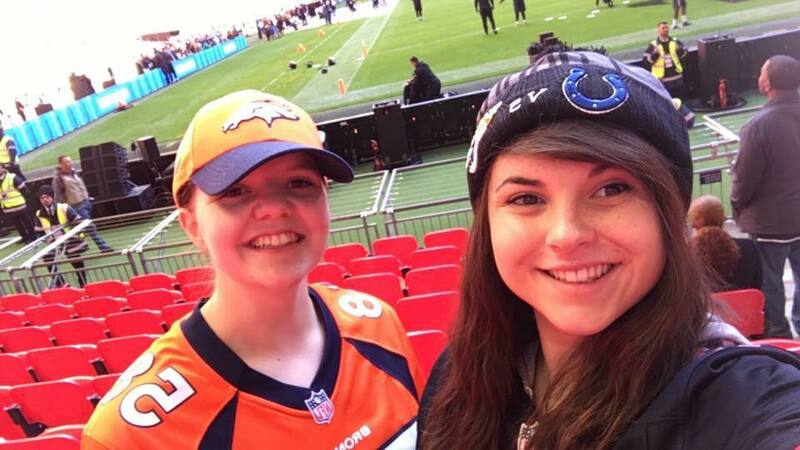 As part of our series in celebrating female NFL fans across the UK, I’d like to introduce you to Abigail Boardman.Abigail is a Denver Broncos fan shares with us how she got in to the NFL, how she made the choice of her team as well as more about her overall experience as a fan. The first full game of NFL I can remember watching was the Ravens v 49ers in Super Bowl XLVII. I had just turned the TV on and seen that this American Football thing was on and as a big sports fan I thought I’d give it a go. I’d seen some bits of American football in the American TV series’ I watched and was interested to see what it was really like. To try and understand some of the terms and what was actually going on, I was googling during the game to try and learn the rules. As for a team, I wasn’t really backing any one but did love the Ravens jerseys because they had purple in them and that’s my favourite colour. I was in my final year of high school so couldn’t stay up for the whole game but I caught up with the second half the following day and distinctly remember the black out in the third quarter. After seeing this game I knew I was going to follow the NFL the following season. I decided the best way to pick a team to support was to watch as many games as possible early on that season and go with the one I found myself backing most often. I’d already ruled out the Patriots because there was a picture of Tom Brady in my college PE classroom and for some reason it always annoyed me. The team I decided upon was the Denver Broncos! This was mainly down to Peyton Manning and just how mesmerised I was watching him play. 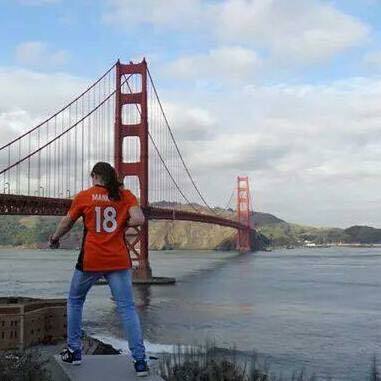 My first jersey was a home Manning jersey bought for me buy a friend on a trip to New York and I was over the moon with it! At this point, I was watching the games but without anyone to talk to about it. I didn’t really know if anyone I was friends with liked the NFL as every time I mentioned it people would just say ‘oh that’s like rugby isn’t it?’. 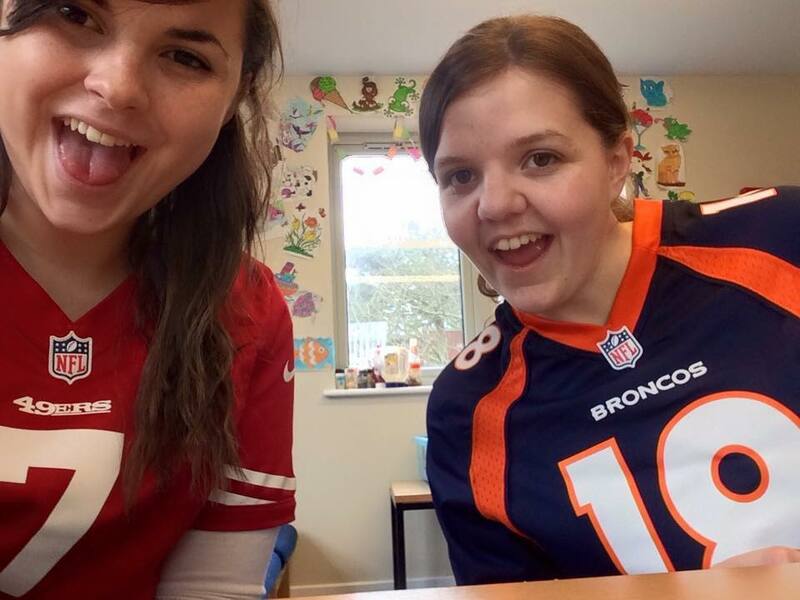 I feel like this went on for a while until I realised my best friend was also watching and was a 49ers fan! Cut to 2015 and we were heading off to our first International Series game- Chiefs v Lions. The atmosphere at the tailgate was unlike anything I’d ever experienced. I was amazed by the fact that there were people wearing jerseys from every team all getting along, laughing and throwing footballs around. I knew this kind of fan merging never happened at English football matches. We headed to our seats to find a family from Kansas City sat behind us. They’d travelled all the way to London because they hadn’t missed a home game in over 10 years! 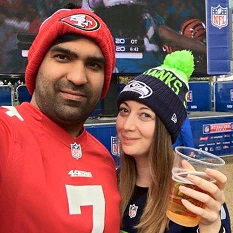 We had some friendly banter, mainly over my Manning jersey, and the fact we were supporting the Lions, and chatted throughout the breaks in the game. We’ve been to an International Series game every year since (adding a few friends to the trip along the way) and this year I finally backed the winning team, the Eagles! One of my highlights since following NFL has to be Super Bowl 50. I had high hopes for my Broncos and wanted them to win even more with all the rumours that Manning would retire after that game. I was watching the game alone at home whilst my family were asleep. It was so hard not to jump about and yell every time the defence caused a turnover or Von Miller got close to Cam Newton. I was silently jumping up and down as the game finished and was so excited I didn’t sleep for hours after the game. I absolutely love sports jerseys. As well as the NFL I like watching baseball, ice hockey and most recently, basketball. I currently own 23 sports jerseys…! There are a lot of Broncos ones in that haul but also jerseys from other teams. I’ve had some stick from some people about why I have other teams jerseys and heard things like ‘that’s such a women’s way of doing things’ or ‘you’re not a real fan’. Personally I like to get jerseys of players I really admire and enjoy watching e.g. JJ Watt, Aaron Rodgers and of course Peyton Manning, whilst he was at the Colts. If I like the player and the style of jersey, I buy them. I don’t think this makes me any less of a Broncos fan and they’ll always be the team I want to win. I just like to be open minded and can appreciate the incredible athleticism and skill of some players. My friend joked that I’ve nearly got a jersey for every day of the month, so now that’s my aim! This year I’m heading to New York and will hopefully manage to catch a game at MetLife whilst I’m out there. I don’t really mind who plays I just can’t wait to experience the atmosphere at a game in the States. My end goal over the next few years obviously is to make it out to Denver to see the Broncos play but for now I’ll settle for one of the New York teams.